A study published this week in the Archives of Internal Medicine concludes that nicotine sampling therapy (giving smokers samples of nicotine replacement therapy [NRT] to promote NRT use) is a promising strategy to promote smoking cessation. The study involved a randomized clinical trial which compared a practice quit attempt intervention with or without the provision of nicotine lozenges to promote the use of NRT among a sample of smokers who were unmotivated to quit. The methods, as describe in the study abstract, were as follows: "Within a nationwide randomized clinical trial (N = 849) to induce further quit attempts and cessation, smokers currently unmotivated to quit were randomized to a practice quit attempt (PQA) alone or to nicotine replacement therapy (hereafter referred to as nicotine therapy), sampling within the context of a PQA. Following a 6-week intervention period, participants were followed up for 6 months to assess outcomes. The PQA intervention was designed to increase motivation, confidence, and coping skills. The combination of a PQA plus nicotine therapy sampling added samples of nicotine lozenges to enhance attitudes toward pharmacotherapy and to promote the use of additional cessation resources. Primary outcomes included the incidence of any ever occurring self-defined quit attempt and 24-hour quit attempt. Secondary measures included 7-day point prevalence abstinence at any time during the study (ie, floating abstinence) and at the final follow-up assessment." The intervention was successful in getting smokers to make quit attempts and to use NRT (presumably in those quit attempts). While only 12.5% of those in the control group used NRT in the post-intervention follow-up period, 69.0% of those in the nicotine sampling therapy group used NRT (presumably to try to quit) during the post-intervention follow-up period. The study concludes that the use of nicotine sampling therapy increases quit attempts and enhances NRT use and is therefore a promising strategy to promote smoking cessation. It might surprise readers to find out that the study actually found that nicotine sampling therapy was ultimately ineffective. At six months follow-up, there was no significant difference in the point prevalence of abstinence between the NRT group (16%) and the control group (14%). Because the intervention had no effect on 6-month smoking cessation rates, it clearly had no effect on the bottom line: sustained cessation. For this reason, I disagree with the study conclusion. I do not conclude that NRT sampling is a promising strategy. I think this study demonstrates that it is a failed strategy. The bottom line is this: it didn't work. At six months, those in the intervention group were just as likely to be smoking as those in the control group. To me, that's a failure. In fact, I believe the study provides strong evidence that NRT is quite ineffective in promoting smoking cessation, at least among smokers who are not motivated to quit. Since 69% of the smokers in the intervention group tried NRT and only 12.5% of smokers in the control group used NRT, the failure to find any difference in cessation at six months suggests that the use of NRT had no effect on smoking cessation. The paper spins the results in an entirely different direction, calling NRT sampling a promising approach. This at first seemed odd to me. However, it then occurred to me that what I see as an apparent bias in the interpretation of the study results could perhaps be a result of a financial conflict of interest, something I have observed time and again in the NRT literature. And in fact, in turns out that two of the study authors have or have had significant conflicts of interest with Big Pharma. develops and sells smoking cessation medications. During this time, he has accepted honoraria or consulting fees from the following nonprofit and for-profit organizations and companies that develop, sell, or promote smoking cessation products or services or educate or advocate about smoking cessation: Abbott Pharmaceuticals, Aradigm, ... DLA Piper, EPI-Q, ... Evotec, Free and Clear, GlaxoSmithKline, Golin Harris, Healthwise, Integrated Communication, Invivodata, ... McNeil Pharmaceuticals, Novartis Pharmaceuticals, ... Pfizer Pharmaceuticals, Pinney Associates, Propagate Pharmaceuticals, Reckner Associates, Scientia." Thus, this author has substantial financial conflicts of interest by virtue of his research funding and consulting income from a number of pharmaceutical companies that develop, sell, or promote smoking cessation medications. A second author does not have any current conflict of interest, but previously, he reports having consulted for and received consulting payments from GlaxoSmithKline for helping the company market its Nicorette Fruit Chill gum. Though this financial relationship with the pharmaceutical company occurred in 2006, I explained earlier why I believe it is still very much relevant for the reader of the present study. This is another example of a research study where I come to a very different conclusion than the article does about the effectiveness of NRT. And once again, the difference in interpretation has at least the appearance of potentially resulting from bias associated with a financial conflict of interest with Big Pharma. I think this is a very serious issue because in my opinion, the obsession with NRT in smoking cessation treatment has been the greatest obstacle to finding an effective approach to helping smokers quit. Thus, it is an obsession that in my opinion has cost lives by diverting attention and resources from more effective potential approaches. I find it particularly unfortunate, therefore, that what I see as a skewed presentation of the science on NRT's effectiveness has the appearance of being influenced by financial conflicts of interest with pharmaceutical companies. A medical oncologist at the Palm Beach Cancer Institute has publicly claimed that smoking may be less hazardous than using electronic cigarettes, according to an article on the ABC Action News web site. A physician spokesman for the local American Lung Association was quoted in the same article as declaring that we have no idea what chemicals are present in electronic cigarettes. According to the article: "Touted as a safer alternative to traditional smoking, electronic cigarettes are supposed to give smokers their nicotine fix without the cancer-causing side effects of tobacco. But some have serious concerns that the battery-operated vaping devices may actually pose more dangers to users. ... Dr. Mike Feinstein, a spokesman for the American Lung Association said, 'People are inhaling some type of chemical vaporized compound into their lungs without really knowing what's in it.' Last year, The American Lung Association issued its own warning about e-cigarettes. 'This is a buyer stay away, a buyer health hazard, potentially.'" "Doctor Robert Greene treats lung cancer patients at the Palm Beach Cancer Institute and said the product is potentially a health hazard. 'There really is no information about whether they're safe or not, and that's part of the problem.' He says with no real data on e-cigarettes, the three-year-old tobacco alternative may actually be more harmful that traditional cigarettes. 'The doses of nicotine that you get could conceivably be higher than what you would get in a typical cigarette.'" It is ludicrous to suggest that electronic cigarettes may be more hazardous than tobacco cigarettes. Tobacco cigarettes deliver tobacco smoke with more than 10,000 chemicals, including more than 60 carcinogens, and cause more than 400,000 deaths annually in the United States. In contrast, electronic cigarettes contain no tobacco, involve no combustion, produce no tobacco smoke, and have not been documented to cause any adverse health effects, despite their use by approximately 2.5 million people in the U.S. Moreover, electronic cigarettes have been tested for carcinogens and have been found to contain more than one thousand times lower concentrations of tobacco-specific nitrosamines than regular cigarettes. They have also been extensively tested in the laboratory to identify the chemicals they contain and no other carcinogens have been detected. Thus, it seems beyond dispute that electronic cigarettes are much less hazardous than tobacco cigarettes in terms of cancer risk. In fact, we know a lot more about the chemicals in electronic cigarettes than in tobacco cigarettes. While as many as 94% of the chemicals in tobacco smoke are unknown, the chemicals in multiple brands of electronic cigarettes have been identified using gas chromatography/mass spectrometry. So far, no chemicals of major concern have been identified at levels that would pose a substantial threat to health (other than the nicotine itself). The only real concern is the potential effect of the long-term inhalation of propylene glycol, but two initial animal studies have documented no health risks. Furthermore, literally hundreds of thousands of Americans are using electronic cigarettes successfully to quit smoking or cut down significantly on the amount that they smoke, and despite four years of use, no serious adverse effects have been reported. Given what he surely knows about the cancer risks of active tobacco smoking, it is mind-boggling that a medical oncologist would claim that smoking may be healthier than inhaling vapor from tobacco-free e-cigarettes that primarily deliver just nicotine, glycerin, and propylene glycol to the user, and with documented carcinogen levels (tobacco-specific nitrosamines) that are more than one thousand times lower than in tobacco cigarettes. It is also surprising that a physician with the American Lung Association would falsely claim that we have no idea what is in electronic cigarettes, given the existence of at least 18 studies which have categorized the chemical constituents of e-cigarettes using gas chromatography/mass spectrometry. That these individuals made these uninformed or ill-informed statements publicly I find to be irresponsible, because it misleads probably thousands of people about the relative health effects of smoking compared to vaping. Would these physicians rather see hundreds of thousands of current e-cigarette users return to cigarette smoking because they believe that returning to cigarette smoking may be safer than continuing to stay smoke-free with the help of tobacco-free, electronic cigarettes? This is perhaps the worst medical advice I have ever witnessed being delivered. Researchers from the Mayo Clinic have reported finding a 45% reduction in the rate of admissions for heart attacks in Olmsted County, Minnesota from the 18 months prior to a workplace smoking ban implemented in 2002 to 18 months after a strengthened ban implemented in 2007. These results are being presented to the media in a way that is implying that the observed 45% reduction in heart attack admissions is attributable to the county smoking bans. For example, the headline of an ABC News article reads: "Smoking ban cuts cardiac events 45%, Mayo Clinic says." A Procor headline reads: "Smoking ban cuts heart attacks in half." A Thirdage.com article headline reads: "Smoking Ban Cuts Heart Attack Risk In Half." The UPI headline about the research reads: "Smoking ban cut heart attacks risk in half." The Minneapolis Star-Tribune headline reads: "Smoking bans cut cardiac events 45%." The EMax Health headline is: "Smoking bans reduce heart attack rates by half, finds study." The Business Insider headline reads: "Heart Attacks Decreased By 50% After These Workplaces Launched Smoking Bans." These headlines appear to be consistent with the information being provided to reporters by the study investigators. As a KAAL-TV article explains: "A new study from Mayo Clinic shows people who live in Olmsted County are nearly 50 percent less likely to suffer a heart attack than they were a decade ago. The study's main author claims the dramatic change is due entirely to the county's smoke-free laws. "We were absolutely shocked..." said Richard Hurt, M.D. Dr. Richard Hurt, the director of Mayo Clinic's Nicotine Dependence Center, is talking about the results of a recent second hand smoke study conducted in Olmsted County. In 2002, the county enacted a smoking ban in restaurants and expanded that to include work places in 2007. Since then, the study shows that heart attacks have dropped 45 percent. And sudden cardiac deaths have dropped 50 percent. Dr. Hurt says despite the numbers, all the other factors that cause heart attacks either stayed the same or got worse. 'So high cholesterol stayed the same, hypertension stayed the same, diabetes went up, obesity went up. So all the other risk factors for heart disease did not change,' he explained. 'So we don't have any explanation other than second hand smoke.'" These findings were presented last week at the American Heart Association Scientific Sessions in Orlando, Florida. So far as I can tell, there is no actual study or report available for public review. Thus, the precise methodology used is not clear. Today's story illustrates the dangers of drawing conclusions from quasi-experimental studies without including a comparison group. 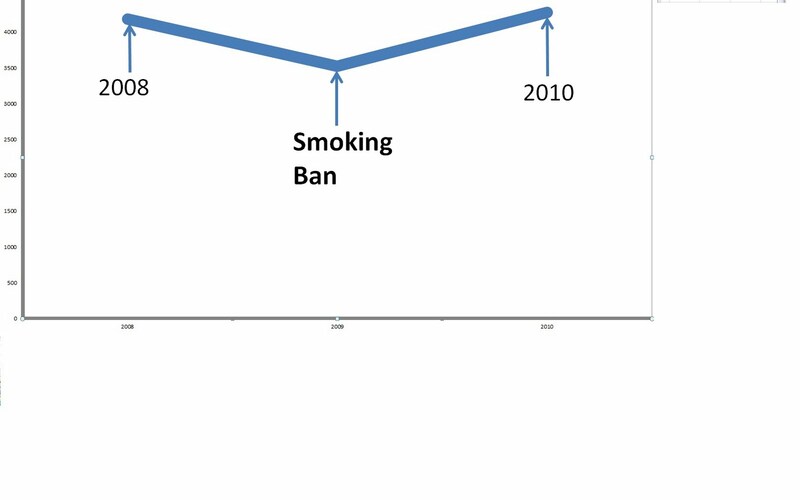 A quasi-experimental study is one in which investigators observe changes in an outcome variable (in this case, heart attacks) following the implementation of an intervention or " natural experiment" (in this case, the Olmsted County smoking ban). Because one never knows what would have occurred in the absence of the intervention, it is imperative in a quasi-experimental study design to include a comparison group to control for underlying secular changes taking place in the outcome variable over time in the absence of the intervention. Unfortunately, it does not appear that the Olmsted County "study" employed any comparison group or attempted in any way to compare the 45% reduction in heart attack admissions in Olmsted County to the reduction in heart attack admissions that theoretically might have been occurring in the rest of the state of Minnesota. Instead, the "study," the press release, and the researchers appear to have completely ignored secular changes in heart attacks occurring in Minnesota during the study period. From none of these sources is it revealed that heart attacks throughout the entire state of Minnesota also might have been declining during the study period, so that the 45% decline observed in Olmsted County might not be entirely attributable to the smoking ban. A. No change in the heart attack admissions rate from 2001 to 2008. B. A decrease of 3% in the heart attack admissions rate. C. A decrease of 8% in the heart attack admissions rate. D. A decrease of 14% in the heart attack admissions rate. E. A decrease of 33% in the heart attack admissions rate. According to the news articles, and according to the investigator's quote in the KAAL-TV article, one would have to assume that there was no change in the heart attack admissions rate for the state of Minnesota from 2001 to 2008 since the study and its presentation to the media and the public essentially attribute the entire 45% reduction in the heart attack admission rate to the smoking ban. Therefore, even in the absence of any smoking ban, one would have expected the heart attack admission rate in Olmsted County to have declined by 33% from 2001 to 2008, simply based on the trend occurring throughout the state of Minnesota. In light of the expectation of a 33% decline without a smoking ban, the finding of a 45% decline now doesn't seem nearly as dramatic, does it? In fact, smoking prevalence in Olmsted County dropped sharply, by 23%, during the study period. It is conceivable that the additional 12% decline in heart attacks over the expected 33% decline was mostly attributable to the sharp decrease in smoking rates. Thus, it is entirely possible that the smoking ban - and specifically the decrease in secondhand smoke exposure - had very little impact on heart attack rates during the study period. To answer that question would require a more rigorous analysis that adjusted not only for secular trends in heart attacks in Minnesota as a whole but also for changes in smoking prevalence that may not have been a result of the smoking ban. Based on the only data presented in this "study" - the change in heart attack admissions rates in Olmsted County alone - one is unable to draw any conclusion about the impact of the smoking ban and secondhand smoke exposure on heart attacks, much less to be able to conclude that the observed 45% reduction in heart attacks was attributable to the smoking ban. An honest press release would have revealed that while heart attack admissions in Olmsted County declined by 45% from 2001 to 2008, heart attack admission rates in the state of Minnesota as a whole declined by 33%. Similarly, an honest presentation at the AHA conference would have disclosed that the 45% decline in heart attacks in Olmsted County must be interpreted in light of a 33% reduction in heart attacks in the state as a whole. The rest of the story is that I believe the Mayo Clinic investigators have deceived the media and the public by failing to disclose the striking decrease in heart attack admission rates in Minnesota as a whole during the study period. It completely changes the public's and the media's interpretation of the meaning of the observed 45% decline in Olmsted County to know that heart attacks declined by 33% in the state of Minnesota as a whole during the same time period. I want to make it clear to readers that I agree with the investigators' overall conclusions about smoking bans. I support these policies and I agree with their recommendation that people with heart disease avoid exposure to secondhand smoke. However, I do think that we need to support smoke-free policies with rigorous scientific evidence. Drawing causal conclusions from a quasi-experimental study without any comparison group is not, in my opinion, an example of rigorous scientific evidence, especially in a situation like this where the outcome variable is well known to be declining dramatically throughout the population. Note that there are two posts today: one on electronic cigarettes and the second on an anti-smoking advocate's call for censorship of opposing opinions. Health authorities in Australia have banned the use of electronic cigarettes because, as they argue, vaping mimics smoking and encourages people to continue smoking. According to an article in the Canberra Times: "Canberrans keen to try smokeless ''e-cigarettes'' are running a legal tightrope, with the product banned across Australia despite its increasing availability online. ... The Australian Medical Association said there was no evidence ''e-cigarettes'' helped people quit, and Victorian AMA president Harry Hemley warned the products posed a serious health risk. ... ACT Health said e-cigarettes also encouraged people to continue smoking behaviour. ''Because e-cigarettes mimic smoking in both design and use, the ACT Health Directorate does not support [their use],'' a spokeswoman said. ''The Health Directorate strongly advocates the de-normalisation of smoking and e-cigarettes are counterproductive to this goal.''" Australian health authorities are completely missing the point. Electronic cigarettes are helping thousands of vapers to stay off of cigarettes precisely because their use mimics smoking. Unlike nicotine replacement therapy or other "approved" drugs for smoking cessation, electronic cigarettes address both the pharmacologic and behavioral aspects of smoking addiction. They are effective specifically because they mimic smoking and thus replace many of the behavioral stimuli associated with cigarette smoking. Moreover, contrary to the ACT Health Directorate statement, electronic cigarettes do not encourage continued smoking. They are overwhelmingly used by smokers to quit or substantially cut down on smoking. Every electronic cigarette that a smoker uses is one less tobacco cigarette smoked. There is no evidence to support the claim that e-cigarettes in any way inhibit smoking cessation. But there is abundant evidence that e-cigarettes are helping thousands of smokers to quit smoking or cut down on the amount they smoke. A clinical trial of e-cigarettes among smokers with no interest in quitting found that 55% of subjects either cut down their consumption by 50% or more or quit smoking altogether at six months follow-up. This is remarkable, especially since these smokers had little motivation to quit. Imagine how effective e-cigarettes likely to be in reducing smoking among smokers who actually want to quit. A further problem with the Australia health authorities assertions is that there is no evidence that e-cigarettes pose health risks (beyond the continued use of nicotine). The Australian Medical Association claims that e-cigarettes poses serious health risks, but does not reveal what those health risks are. That's because none have yet been identified. In fact, e-cigarettes reduce health risks because they usually eliminate or substantially reduce the amount of tobacco smoke that a smoker inhales. The Polosa study demonstrated this. Thus, the best current evidence is that e-cigarettes substantially reduce one's health risks. The Australian health authorities have it all wrong. And it appears that they have tipped their hand as to why. Their opposition is purely ideological: "e-cigarettes mimic smoking in both design and use." In other words, they oppose e-cigarettes simply because they look like and are used like regular cigarettes. The fact that they contain no tobacco and do not produce any smoke is irrelevant. The fact that they most likely greatly reduce health risks is irrelevant. The fact is that they look like regular cigarettes and therefore are bad and their use must be discouraged. This is no longer about health - it is about a moral principle: people should not do anything that looks like smoking. In fact, the e-cigarette is effective (and probably more effective than NRT) specifically because it mimics smoking. My guess is that the smoking cessation product of the future is going to be some sort of device that mimics smoking but is not tobacco-based and produces no smoke (whether an electronic cigarette or some similar smoke-free, tobacco-free, nicotine-delivering device). Such a product could literally save millions of lives. But it doesn't matter, because it looks like smoking. A prominent anti-smoking researcher attempted to get a newspaper to ban comments from several individuals who disagreed with his position on the protection of residents of multi-unit dwellings from secondhand smoke exposure. The anti-smoking advocate wrote: "The Greenbelt Patch that has carried several stories on the Schuman v. GHI & Popovic trial. The site has a Message Board, which has been attacked by semi-pro Tobacco Industry Spammers with the obvious intent of drowning out support for Schuman. These spammers, who go by the names of Michael J. McFadden, a FORCES.org columnist, as well as Kevin Mulvina, and Magnetic, among several others, invariably pollute the message boards relating to on-line tobacco-related stories with the clear intent of drowning out alternative opinion with their fanatical flat-earth pseudo-science. Some webmasters have become wise to this, and some moderated sites have banned these industry moles. Unfortunately this has not happened with the Patch blog." In response, the newspaper wrote: "Free speech allows for dissenting opinions, no matter what any individual thinks about each one, or collectively all of them. When we start talking "bans," we really are saying "censorship." That's the thing about free speech, we can't have it both ways." While I happen to agree with the advocate's position on secondhand smoke in multi-unit dwellings and I believe that nonsmokers deserve a remedy in the case that smoke is polluting the air in their apartments and causing health effects, I do not believe that censorship of opposing comments from private individuals is appropriate. So I agree with the position that the newspaper took. I believe that public health is just that: "public." It involves regulating the behavior of the public and we should therefore be willing to listen to what the public has to say, even if we disagree. Censorship does not advance our interests, even if it silences the "opposition." The advocate would have a point if these individuals were actually tobacco industry representatives or if they were being paid by the tobacco industry to state these opinions. In that case, it would not be unreasonable to restrict the comments or to require that the authors disclose their tobacco industry affiliations. However, the advocate provides no evidence that these individuals are paid by the tobacco industry and the truth is that they are indeed private individuals and not industry representatives. So there are actually two problems here. One is the promotion of censorship. The second is the making of false public accusations about individuals in an attempt to discredit them. Discredit all you want but do not base it on false and unsupported public accusations. In a letter to the editor published last week in the New York Times, the director of smoking cessation services at Columbia University Medical Center urges smokers not to quit using electronic cigarettes because it involves "directly inhaling heated nicotine into the delicate tissue of smokers’ lungs." He praises nicotine replacement therapy as a "proven" aid to smoking cessation. I have news for you. Smoking cigarettes involves "directly inhaling heated nicotine into the delicate tissue of smokers’ lungs." Would we rather that smokers directly inhale heated nicotine plus 10,000 other chemicals or that they just inhale the nicotine? For literally thousands of ex-smokers, electronic cigarettes have helped them to stop or greatly cut down on their cigarette smoking. Many of these are smokers who tried to quit with NRT but failed. Telling them that they should not use electronic cigarettes is tantamount to recommending that they return to cigarette smoking instead of continuing to stay smoke-free with the help of electronic cigarettes. Moreover, to call NRT a "proven" strategy for smoking cessation is misleading. What NRT has been "proven" to do is to fail in about 92% of quit attempts. For a while, I was baffled by why a physician would offer this strange advice to smokers, and based on such flawed reasoning. I reasoned that like many other opponents of electronic cigarettes, he must have a financial tie to pharmaceutical companies. This was not the case. However, I did discover that the author appears to have an interest in opposing e-cigarettes, as he has written a book on quitting smoking that relies heavily upon the use of traditional pharmacotherapy and his web site solicits speaking engagements for the presentation of his smoking cessation method. He even has his own publicist and literary agent. While I am not claiming that there is a financial interest involved (I believe that the author should have disclosed whether or not he receives any money from the sale of his book and/or from speaking engagements), there does appear to be a major conflict of interest. The rest of the story is that this is yet another example of an anti-smoking professional who is publicly opposing electronic cigarettes, but without revealing that he has a conflict of interest. The public deserves unbiased and unconflicted, science-based recommendations on strategies to improve their health, especially when the advice may potentially lead to harm for thousands of individuals. In a commentary on the UCSF Center for Tobacco Control Research & Education web site, Professor Stan Glantz criticizes Judge Leon's ruling, in which the D.C. district court issued a preliminary injunction against the implementation of the FDA's graphic cigarette warning labels. The basis of Dr. Glantz' criticism of the decision is that the imposition of the warning labels is justified because they "will certainly reduce smoking." He calls this a "public health justification" for the warning labels and chastises Judge Leon for his "blithe disregard for public health." The central point of Dr. Glantz' argument is as follows: "Accomplishing the goal of protecting public health requires providing warning labels that will affect behavior (preventing people from starting to smoke or convincing them to quit), something that Judge Leon asserts goes beyond “providing objective information” into the forbidden (political) realm of “advocacy.” If one takes Judge Leon’s position to its logical conclusion, the only warning labels that would be constitutionally permitted would be ones that would not stimulate a behavior change (since those would not be “advocating” for anything)." Unfortunately, Dr. Glantz' argument is flawed. He misinterprets Judge Leon's ruling. The Court did not hold that the graphic cigarette warning labels are unconstitutional because they would stimulate a behavior change. Instead, what the Court ruled was that the graphic warning labels go beyond the provision of simply factual and uncontroversial information and are therefore subject to a higher level of scrutiny. And under that higher level of scrutiny, the warning labels violate the tobacco company's First Amendment rights because they are much broader than necessary to advance the government's interest of informing smokers about the health effects of cigarettes. Dr. Glantz argues that under Judge Leon's logic, the only warning labels that would be allowed are ones which do not stimulate a behavior change (i.e., quitting smoking). This is not the case. Any warning label that construes factual and uncontroversial information would be allowed, regardless of its effects on consumer behavior. For example, if the FDA chose to require a warning that said: "Cigarettes contain radioactive polonium-210" and the FDA had conducted formative research suggesting that such a factual warning would result in 25% of smokers quitting, such a warning would still be allowable under Leon's logic. As long as the warning is factual and uncontroversial, then it is not subject to strict scrutiny and would be allowable, even if it covers half of the cigarette pack. The primary flaw in Glantz' argument is that it is not the effect of the warning label that makes it unconstitutional, it is the nature of the warning label. Regardless of how many people will quit smoking because of it, a warning label that is purely factual is permitted. Where the FDA's mandated warnings cross the line (into requiring stricter scrutiny under the Court's holding in Zauderer [Zauderer v. Office of Disciplinary Counsel for Sup. Ct. of Ohio, 471 U.S. 626,651 (1985)] is in their failure to stick to factual and uncontroversial information, and instead, to directly and primarily attempt to get consumers to quit smoking. For example, the requirement that the smoking quitline number be prominently displayed on the package is, according to Leon, evidence that the purpose of the warning labels is to directly promote smoking cessation, not just to warn smokers of the health effects of cigarettes. And further, "it is abundantly clear from viewing these images that the emotional response they were crafted to induce is calculated to provoke the viewer to quit, or never to start, smoking: an objective wholly apart from disseminating purely factual and uncontroversial information." While one could make an argument to counter the Court's ruling, such an argument would have to provide a rationale for either: (1) why the cigarette warning labels are not subject to strict scrutiny; or (2) why the cigarette warning labels can survive a strict scrutiny analysis. Dr. Glantz' argument fails to address either of these. Because public health regulations must adhere to the Constitution, it is not as simple as arguing that the graphic cigarette warning labels are justified because they will certainly reduce smoking. The standard that the courts must use in determining whether the required warnings violate the cigarette companies' First Amendment rights is not simply whether they will advance the government's interest in protecting or improving the public's health. Instead, the question is first, to what level of scrutiny is this regulation subject and second, does the regulation pass such scrutiny? If Judge Leon is wrong, it is not because of a "blithe disregard for public health." He could be wrong because of a blithe misinterpretation of Zauderer or a flawed assessment of the narrowness of the warning labels under Central Hudson. But the fact that his ruling blocks implementation of a regulation that would decrease smoking rates is not due to any failure of the court to consider the impact of the regulation on the public's health. In fact, Leon's consideration of the public health effects of the regulation played a role in his decision (he accepted the FDA's own analysis showing that there was no statistically significant predicted reduction in smoking). Under Glantz' argument, we could and should be requiring graphic warning labels on all unhealthy consumer products -- warnings that directly implore consumers not to use those products. McDonalds could be required to post disgusting pictures of people with diseases caused by obesity at the point of purchase. Beer bottles could be required to include the phone number of Alcoholics Anonymous. My beloved Vienna Fingers could be required to include a graphic depiction of diseases related to increased fat intake. There needs to be some limit on the degree to which the government can interfere with the free speech of companies, especially when those companies are being required to make statements which directly implore their consumers not to use those products. While my personal opinion is that the courts have been overly generous in granting First Amendment protection to corporations, I would never go so far as to argue that compulsion of speech by corporations is always justified if that speech would advance the public's health. This is, however, precisely the argument that Dr. Glantz is making when he asserts that the graphic warning labels are justified because they will certainly reduce smoking. According to an article by CDC researchers published online ahead of print in Tobacco Control, the proportion of U.S. adults who have ever used electronic cigarettes more than quadrupled from 0.6% in 2009 to 2.7% in 2010. The overall proportion of adults who had used electronic cigarettes in the past 30 days in 2010 was 1.2%. Since the adult U.S. population in 2010 was approximately 209 million, the estimated number of current (past-month) electronic cigarette users is about 2.5 million. These data are important for three reasons. First, to the best of my knowledge, this is the first scientific estimate of the number of electronic cigarette users in the U.S. It helps to define the magnitude of electronic cigarette use, which is useful in public policy discussions regarding vaping and its regulation. Second, these data demonstrate that taking electronic cigarettes off the market - as recommended by a number of anti-smoking groups - would have devastating effects on the public's health. We now know that there are literally hundreds of thousands of vapers who are using electronic cigarettes to reduce their cigarette consumption or to quit smoking entirely. Taking electronic cigarettes off the market would force most of these individuals to return to smoking, which would have devastating health effects. Third, the fact that the number of electronic cigarette users has more than quadrupled in just one year suggests that smokers are finding these devices helpful. If they were ineffective - as suggested by some anti-smoking researchers - one would not expect the market to take off as it is. In response to yesterday's post in which I revealed that an anti-smoking researcher posted a defamatory comment on the Smokefree DC web site which falsely accuses Michael McFadden of being paid by the tobacco industry to oppose tobacco control measures, I received a number of responses from tobacco control advocates defending the defamatory comment. The advocates who defended the defamatory comment had two main arguments. First, McFadden has published on the FORCES site and FORCES is known to be a tobacco industry front group. Second, there is no proof that McFadden has not taken tobacco industry money. The advocates have it wrong on both accounts. Taking the second argument first, the burden of proof is upon the one making an accusation to provide evidence to support that accusation. If someone writes on my blog that I have taken tobacco money to write posts that oppose outdoor smoking bans, the burden of proof is on that individual to provide the evidence to back up his claim. As far as the first argument goes, it is simply not true that FORCES is a tobacco front group, and no evidence has ever been put forward to support that claim. More than five years ago - on February 28, 2006 to be exact - I issued a challenge to all anti-smoking groups and advocates to produce evidence that FORCES had received major funding from tobacco companies. There was no response, and to date, I have still not received or seen any evidence to support the front group assertion. Americans for Nonsmokers' Rights continues to insinuate that FORCES is a tobacco industry front group, but has yet to provide any evidence. The only relevant fact that ANR provides is that: "a 1999 Philip Morris (PM) memo indicated that FORCES did not accept tobacco industry funding." So in fact, ANR knows that FORCES is not a Big Tobacco front group but continues to make the false accusation anyway. This is exactly why I parted ways with ANR (I was at one time a member of ANR's Board of Directors). In my book, you don't make accusations or insinuate that a group is being funded by someone unless you have documentation to back it up. The rest of the story is that ANR and a number of anti-smoking advocates continue to accuse FORCES of being an ally/front group of Big Tobacco without documenting any current relationship between the two and in light of the admission that there is in fact no evidence to link the two. Even worse, some anti-smoking advocates are falsely accusing private citizens like Michael McFadden of being tobacco industry-funded "moles" in an effort to discredit them. It is high time that we acknowledge that there are reasons why some individuals and groups to which they belong are unhappy with smoke-free laws, and that they don't have to be operating under the direction or funding of Big Tobacco to have these opinions. Opposing smoke-free laws doesn't necessarily make you a Big Tobacco front group. FORCES is a great illustration of this. FORCES is a genuine group without funding from Big Tobacco which opposes smoke-free laws not because they are trying to protect the tobacco industry's profits, but because they don't want government telling them what to do and they don't believe that secondhand smoke is a health hazard that would justify government intrusion into the rights of businesses and individuals. I don't necessarily agree with that viewpoint, but I acknowledge it as a legitimate and genuine point of view that reflects the feelings of its membership and does not mean that the group is connected with Big Tobacco. It seems to me that this trend in making statements without having documentation is occurring both in how we treat opponents of smoke-free laws as well as in how we communicate to the public about the health effects of secondhand smoke. We have become much less concerned about having documentation to support our attacks against opposition groups and much less concerned about having documentation to support our scientific claims as well. It just seems to me that we are unable to allow the truth and documentation of the facts to get in the way of pursuing our agenda. I think it violates a basic ethical principle of public health practice to operate in this way. ADDENDUM - November 17, 2011 - 8:55 a.m.: I have just been informed that the defamatory comment has been removed from the Smokefree DC web site. I applaud this action and hope that it will usher in a new era in which we can treat members of the public with respect, even if they oppose our policies, and in which we can stick to the truth and to documented facts. IN MY VIEW: Anti-Smoking Advocates Should Not Post Defamatory Accusations Against Private Citizens, Even the "Opposition"
On the Smokefree DC web site, an anti-smoking researcher/advocate posted a comment which claims that Michael McFadden is a tobacco industry mole, meaning an individual affiliated with the tobacco companies who repeats Big Tobacco propaganda without revealing his connections to the industry. Specifically, the anti-smoking researcher claimed as follows: "MOLE WARNING: There’s a Greenbelt Community On-line newsletter operated by the Greenbelt Patch that has carried several stories on the Schuman v. GHI & Popovic trial. The site has a Message Board, which has been attacked by semi-pro Tobacco Industry Spammers with the obvious intent of drowning out support for Schuman. According to Gene Borio, who operates an extremely informative daily tobacco newsletter, these spammers, who go by the names of Michael J. McFadden, a FORCES.org columnist, as well as Kevin Mulvina, and Magnetic, among several others, invariably pollute the message boards relating to on-line tobacco-related stories with the clear intent of drowning out alternative opinion with their fanatical flat-earth pseudo-science. Some webmasters have become wise to this, and some moderated sites have banned these industry moles." The term "tobacco industry mole" has been used in the tobacco control literature to denote tobacco industry "spies" who essentially pose as private citizens who oppose tobacco control measures but who are really tobacco industry representatives or otherwise financially connected with the industry. By calling McFadden a tobacco industry mole and by also calling him a semi-professional tobacco industry spammer, the clear connotation of this attack is that McFadden is not a private citizen who opposes smoking bans, but a paid tobacco industry representative with a tobacco company affiliation. To the best of my knowledge, Michael McFadden is neither a tobacco industry mole nor a semi-professional tobacco industry representative. In fact, I do not believe that he has any affiliation with the tobacco industry, nor do I believe that he has received tobacco industry payments to express his opinions. In other words, I believe the claim being made by the anti-smoking researcher in his accusation is a lie. Because the comment was made in an attempt to discredit McFadden by falsely tying him to the tobacco industry, I believe the comment is a defamatory one. If made on my blog, I would have deleted it for legal reasons. I am surprised that the Smokefree DC web site allows such a defamatory comment, especially when no evidence is presented to support the accusation that McFadden is working for the tobacco industry. In my opinion, anti-smoking advocates should not be attacking private citizens with defamatory accusations such as this one. It is below us and reflects poorly on our character as public health professionals. Hopefully, the accusation will either be removed with an apology offered to Michael, or else evidence of Michael's financial relationship with one or more tobacco companies will be provided in timely fashion. If the latter, I am sure that Michael will share some of his earnings with his old friend at the Rest of the Story. Last week, I revealed that a new report out of North Carolina concluded that the statewide smoking ban resulted in a 21% decline in heart attack admissions, although the actual data showed a 21% increase in heart attack admissions among women and a slowing of the overall rate of decline in heart attacks in the state. Today, I share data first reported by Jacob Grier over at Liquidity Preference which demonstrated that the statewide smoking ban in Oregon was not associated with any significant increase in the rate of decline in heart attack admission rates in that state. The following data and graph are copied directly from Jacob Grier's blog Liquidity Preference. Credit goes to Jacob Grier for obtaining these data from the Oregon state health department and for producing the figure. Source: Jacob Grier. Whatever Happened to Oregon's Heart Miracle. Liquidity Preference blog. November 2, 2011 [link]. 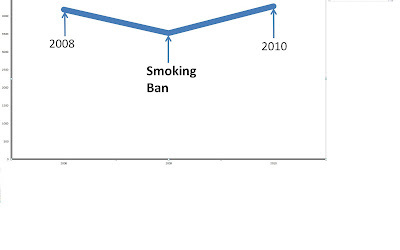 As you can see from the figure, there was no change in the rate of decline in heart attacks in Oregon during the first year of the implementation of the smoking ban. If anything, the rate of decline in heart attacks slowed during the second year of the smoking ban. The heart attack admission rate fell by about 7% in the year prior to the smoking ban and by about 7% in the first year following the smoking ban's implementation. However, the rate of decline slowed to just above 3% in the second year following the smoking ban's implementation. Jacob Grier summarizes this analysis in a commentary published at OregonLive.com. Grier writes: "When Oregon's smoking ban took effect in 2009, we were promised that it would usher in drastic reductions in heart attacks. A January 2009 story in this paper reported that even brief exposure to secondhand smoke could set the stage for heart attacks and cited research claiming that banning smoking in bars and restaurants could reduce them by 41 percent over three years. Later in 2009 cardiologist Ty Gluckman suggested in The Oregonian Commentary section that we might see a drop in heart attacks of 17 percent in the first year, saving the state $40 million. So, how's that working out for us?" "I contacted the Oregon Public Health Division to ask for the latest data. The good news is that heart attack rates in Oregon have been in steady decline since 2003, the earliest year for which I have data. The bad news for smoking ban advocates is that the ban hasn't noticeably affected this rate and certainly hasn't resulted in the large declines that they predicted. The heart attack rate fell by 7.21 percent in 2009, the first year of the smoking ban. That sounds impressive, but it's in line with drops in recent years. 2004 and 2005 saw greater declines -- 8.67 percent and 7.95 percent, respectively -- and 2008, 6.67 percent. Given this existing trend, it would be spurious to credit the ban for the similar drop in 2009. The ban doesn't fare any better if you include data from 2010. In the two years since the ban took effect, rates have dropped only 10 percent, a much smaller decline than we were told to expect in just one year." In response, a representative of the Greater Portland and Vancouver American Heart and Stroke Association acknowledges that the data presented by Grier are accurate but argues that heart attack rates wouldn't have been expected to decline in Oregon because many cities in the state had already enacted smoking bans. As he writes: "Most published studies of heart attack rates following smoking bans have looked at communities that went smoke-free nearly overnight. This is not Oregon's story." The truth, however, is that according to Americans for Nonsmokers' Rights, there were only 4 communities in Oregon that enacted smoke-free bar or restaurant laws prior to the statewide smoking ban: Corvallis, Eugene, Independence, and Philomath. This is clearly not enough of the state's population to explain why the smoking ban would not lead to an immediate decrease in heart attacks if that is indeed the expected effect of a statewide ban on smoking in all bars and restaurants. The rest of the story is that the data from Oregon do not support the conclusion that the statewide smoking ban led to an immediate and significant decline in heart attacks, as claimed by anti-smoking researchers and groups. This does not mean that the ban is unjustified, because it will eventually reduce cardiovascular disease. But remember, it takes many years for secondhand smoke exposure to result in heart disease. It does not happen overnight. Moreover, the ban has immediate effects on respiratory symptoms of nonsmokers, especially those with asthma or other respiratory conditions. By continuing to rely upon shoddy science to support its conclusions that smoking bans immediately and dramatically reduce heart attacks, the anti-smoking movement is risking losing its scientific credibility. Once that is lost, it will be much more difficult to enact smoking bans. Any short-term gains to be had by touting these Helena-like studies will, in my opinion, be overshadowed by the long-term damage to the scientific credibility of the tobacco control movement. Believe it or not, the following data - which show a 21% increase in heart attacks among women during the first year following North Carolina's smoking ban - are the actual data behind the report out of the North Carolina Department of Health and Human Services which concludes that the smoking ban led to a 21% decline in heart attacks in the state. These data are taken directly from the report. Despite what the report calls a 21% reduction in heart attack admissions during the first year of the smoking ban, the number of heart attack admissions among women was higher after the smoking ban than before. The number of heart attack admissions among women, which dropped from 4182 in 2008 to 3521 in 2009, increased to 4273 in 2010, so that it reached its highest level in three years! It is simply mind-boggling to me how the report, and anti-smoking groups and advocates which have been disseminating the conclusions of the report, can draw the conclusion that the smoking ban reduced heart attacks by 21% when the actual number of heart attacks among women increased by 21% during the first year after the smoking ban was implemented. Apparently, the model used in the report failed to include a time trend and therefore attributed the lower number of heart attacks overall in 2010 to the smoking ban, rather than to the existing trend of decreasing heart attacks in the state. Properly adjusting for the secular time trend in heart attacks would have negated the finding of a 21% decline in heart attacks associated with the smoking ban and instead would have led to the conclusion that heart attacks were higher than expected in 2010. To be clear, I am not suggesting that researchers intentionally omitted the time trend to create this finding. However, I do believe there may have been a subconscious bias toward finding and showing an effect of the smoking ban. We all want to be able to demonstrate the positive results of our enacted policies on the public's health. Here, that bias appears to have clouded the interpretation of otherwise very clear data which fail to show any significant decline in heart attacks attributable to the smoking ban during its first year of implementation. I continue to be boggled by the poor science coming out of the anti-smoking movement in the specific area of the effect of smoking bans on heart attacks. If these were tobacco industry studies purporting to show a negative effect of smoking bans on restaurant sales, but using the exact same methodology, we would be blasting them. Interestingly, in his note to tobacco control advocates, Dr. Glantz argues that the tobacco industry has been criticizing the smoking ban - heart attack studies and insinuates that the only ones criticizing these studies are tobacco company employees or tobacco "sympathizers." Clearly, that is not true. For one, I have been quite critical of these studies and I am not affiliated in any way with the tobacco industry. Additionally, I am not aware that the tobacco companies have publicly opined either way on these studies. The rest of the story is that anti-smoking groups have jumped on to a study which concludes that the North Carolina smoking ban decreased heart attacks by 21% in its first year, when in fact heart attacks among women increased by 21% during that year and the rate of decline in heart attacks overall slowed significantly. This is shoddy science and I believe it threatens to undermine the integrity of the tobacco control movement, risking the loss of our ability to effectively advocate for these and other important public health policies. A new report out of the North Carolina Department of Health concludes that the statewide smoking ban, implemented on January 1, 2010, caused a 21% decline in heart attack admissions during 2010. The report assessed age-adjusted rates for weekly heart attack admissions during the two years prior to the smoking ban (2008 and 2009) and one year after the ban (2010). The effect of the ban was estimated using "generalized estimating equation (GEE) Poisson regression models with an autoregressive correlation matrix to adjust for short-term autocorrelations within clusters of gender, age, and county" (i.e., using a fancy statistical model). The study results were as follows: "Comparison of QIC statistics suggested that the model that provided the best fit to the data was that which only adjusted for the weekly average temperature and for county. This model indicated that the rate of ED visits for AMI was 21 percent lower following the implementation of the smoke-free restaurant and bars legislation. (Rate Ratio [RR] Estimate was 0.79 ; 95% CI: 0.75-0.83)." The study goes further. It then calculates the health care savings due to the smoking ban's reduction of heart attacks. A North Carolina Department of Health and Human Services press release boasts that: "Emergency room visits by North Carolinians experiencing heart attacks have declined by 21 percent since the January 2010 start of the state’s Smoke-Free Restaurants and Bars Law. ... the decline in heart attacks in North Carolina in 2010 represents an estimated $3.3 to $4.8 million in health care cost savings." An immediate announcement by Dr. Stan Glantz, following the release of the report, boasted that heart attacks in North Carolina are "down 21 percent in the first year after the North Carolina smokefree restuarant and bar law took effect." The rest of the story is the actual data, which show quite clearly that the rate of decline in heart attack admissions in North Carolina has slowed since the smoking ban went into effect and that among women, the number of heart attacks has increased. Moreover, the health department's report acknowledges both of these findings! The combination of these two facts leads me to question whether the conclusion of the report is attributable to bias on the part of the anti-smoking groups involved in the research, which (like me) desperately want to see the health effects of their policies. Thus, the actual data show that the rate of decline in heart attacks slowed in the first year after the smoking ban went into effect. The study acknowledges this finding, admitting that: "Interestingly, the rates appear to have consistently declined between the year 2008 and 2009; after that period the rates leveled off at a consistently lower level in the year 2010 (Figure 1)." In other words, the report readily admits that the data demonstrate an increase in the expected number of heart attacks following the smoking ban. Based on the existing secular trend, one would have expected to see about a 10% decline in heart attack admissions. However, the actual decline was only 5.5%. As the report itself acknowledges, the heart attack rates, which were declining prior to the smoking ban, "leveled off" in 2010. Question: From 2008 to 2009 (the year prior to the smoking ban), the number of heart attack admissions among women in North Carolina decreased by 661, from 4182 to 3521, representing a decline of 15.8%. Given the anti-smoking groups' conclusion that the smoking ban led to a 21% reduction in heart attacks, which of the following is the observed reduction in heart attack admissions among women in North Carolina from 2009 to 2010 (the first year of the smoking ban)? The number of heart attack admissions among women increased from 3521 to 4273, an increase of 21.4%. Do you see how ridiculous it is to conclude that the smoking ban in North Carolina led to a 21% decline in heart attack admissions when the actual data show that heart attack admissions among women increased by 21%? Moreover, the report readily acknowledges this finding: "the number of ED visits for AMI increased slightly from 2009 to 2010 in younger and older women." Now you can see why I cannot help but wonder whether there is a bias taking place here: researchers and policy makers are eager to find an effect of their interventions. I, too, share this bias, as I have testified in favor of smoking bans in many states and cities, and would like nothing more than to be able to document a substantial reduction in heart attacks due to these policies. However, if the data don't show it, then the data don't show it and we shouldn't be disseminating these ridiculous, unsupported conclusions. Frankly, the actual data come much closer to showing a 21% increase in heart attack admissions in North Carolina during the first year of the smoking ban than they do to showing a 21% decline in admissions. By the way, if you don't believe me, look at the data yourself. In particular, look at Figure 1, which shows the raw data. You'll see that there was a decline in heart attack admissions prior to the smoking ban but that the decline leveled off somewhat after the ban went into effect. Even the authors of the report do not dispute this. How then, does the report come up with the conclusion that there was a 21% decline in heart attacks due to the smoking ban? It appears to me that this is the result of a flaw in the methodology: the analysis fails to control for the secular trend in heart attacks. In other words, the analysis simply compares the number of heart attacks in 2010 to the number in 2008 and 2009 and finds that it is about 21% lower. If you don't control for the baseline trend in heart attacks, you are going to create an effect that doesn't actually exist. The rest of the story is that instead of a 21% decline in heart attacks due to the smoking ban, there was actually a 21% increase in heart attack admissions among women and a decrease in the rate of decline in heart attacks overall from 10.5% to 5.5%. These data are not consistent with the conclusion in the report, in the press release, or in the announcement being disseminated by Dr. Glantz. My readers understand that I support smoking bans and that this support does not hinge on demonstrating an immediate effect of such bans on heart attacks. The inability to demonstrate such an immediate effect is not a reason to stop protecting workers from secondhand smoke exposure. However, by disseminating these unsupported conclusions and adopting shoddy science to support our policies, I believe that the tobacco control movement is risking its credibility. And if that is lost or undermined, then we will lose our ability to continue to pass laws that protect workers from the dangers of secondhand smoke exposure. And that's the real shame with the rest of the story. An article by John Tierney in yesterday's New York Times highlights the absurdity of anti-smoking groups' opposition to smoking cessation via the use of electronic cigarettes. Tierney first notes the results of a clinical trial on the use of electronic cigarettes as a smoking alternative. In that trial, which involved smokers who had little interest in quitting: "After six months, more than half the subjects in Dr. Polosa’s experiment had cut their regular cigarette consumption by at least 50 percent. Nearly a quarter had stopped altogether." Tierney then notes that: "Though this was just a small pilot study, the results fit with other encouraging evidence and bolster hopes that these e-cigarettes could be the most effective tool yet for reducing the global death toll from smoking." However, as Tierney reveals: "there’s a powerful group working against this innovation — and it’s not Big Tobacco. It’s a coalition of government officials and antismoking groups who have been warning about the dangers of e-cigarettes and trying to ban their sale. The controversy is part of a long-running philosophical debate about public health policy, but with an odd role reversal. In the past, conservatives have leaned toward “abstinence only” policies for dealing with problems like teenage pregnancy and heroin addiction, while liberals have been open to “harm reduction” strategies like encouraging birth control and dispensing methadone. When it comes to nicotine, though, the abstinence forces tend to be more liberal, including Democratic officials at the state and national level who have been trying to stop the sale of e-cigarettes and ban their use in smoke-free places. They’ve argued that smokers who want an alternative source of nicotine should use only thoroughly tested products like Nicorette gum and prescription patches — and use them only briefly, as a way to get off nicotine altogether." "The Food and Drug Administration tried to stop the sale of e-cigarettes by treating them as a “drug delivery device” that could not be marketed until its safety and efficacy could be demonstrated in clinical trials. The agency was backed by the American Cancer Society, the American Heart Association, Action on Smoking and Health, and the Center for Tobacco-Free Kids. ... they cite an F.D.A. warning that several chemicals in the vapor of e-cigarettes may be “harmful” and “toxic.” But the agency has never presented evidence that the trace amounts actually cause any harm, and it has neglected to mention that similar traces of these chemicals have been found in other F.D.A.-approved products, including nicotine patches and gum." The article cites me as stating: "It boggles my mind why there is a bias against e-cigarettes among antismoking groups." While it does continue to boggle my mind, I have come upon two potential influences that may at least explain the anti-smoking groups' positions. First, they appear to share an ideology by which it is impossible to acknowledge that anything good could come out of the use of something called a "cigarette" or by an action that looks just like "smoking." Even when abundant evidence suggests that such a product is helping thousands of ex-smokers to stay off of cigarettes and that the product is much safer than smoking, the ideology of these groups appears to blind them to the overall public health benefits of these products. Second, nearly every one of the anti-smoking groups which opposes e-cigarettes and which called for their removal from the market has received money from pharmaceutical companies that manufacture competing smoking cessation drugs. This bias is, I think, acting subconsciously to cloud these groups' perspectives on the data, the science, and the policy issues. Electronic cigarettes represent a substantial potential threat to the profitability of existing smoking cessation medications and could have implications for sales of these existing products on the order of billions of dollars. A federal district court judge today issued a preliminary injunction against the FDA's graphic cigarette warning label requirements, which were scheduled to go into effect next September. Unless overturned on appeal, this means that the FDA will not be able to implement this graphic warning label requirement pending the outcome of the lawsuit, which was filed on First Amendment grounds by R.J. Reynolds, Lorillard, and three smaller tobacco companies. The primary argument of the tobacco company plaintiffs was that while requiring factual and uncontroversial information on cigarette packs is permissible, the large graphic warnings which are intended to solicit an emotional response along with a telephone hotline number for smoking cessation service go beyond this and essentially require the tobacco companies to place an anti-smoking billboard on their packages. Judge Richard Leon of the District Court of the D.C. Circuit agreed with the plaintiffs, finding that the graphic warning labels are intended and designed not to convey factual information about smoking and health, but to discourage people from smoking. Leon writes: "Unfortunately for the Government, the evidence here overwhelmingly suggests that the Rule's graphic-image requirements are not the type of purely factual and uncontroversial disclosures that are reviewable under this less stringent standard. Indeed, the fact alone that some of the graphic images here appear to be cartoons, and others appear to be digitally enhanced or manipulated, would seem to contravene the very definition of "purely factual." That the images were unquestionably designed to evoke emotion - or, at the very least, that their efficacy was measured by their "salience," which the FDA defines in large part as a viewer's emotional reaction ... further undercuts the Government's argument that the images are purely factual and not controversial ... . Moreover, it is abundantly clear from viewing these images that the emotional response they were crafted to induce is calculated to provoke the viewer to quit, or never to start, smoking: an objective wholly apart from disseminating purely factual and uncontroversial information." Judge Leon then analyzes the graphic warning label requirement under strict scrutiny and fails to find that the government has either demonstrated that it will advance a legitimate and significant government interest or that it is tailored as narrowly as possible to advance that interest. Leon writes: "In short, the Government has neither carried its burden of demonstrating a compelling interest, nor demonstrated how the Rule is narrowly tailored to achieve a constitutionally permissible form of compelled commercial speech." Because he finds that the tobacco companies are likely to prevail on the merits of their First Amendment challenge and because they are likely to suffer irreparable harm if the requirement is implemented, Judge Leon issued a preliminary injunction, barring implementation and enforcement of the requirement while the Court considers and decides the case. "There are two problems with the required graphic warning labels that I believe renders them subject to potential violation of the First Amendment. First, as the tobacco companies argue, it is going to be difficult for the FDA to assert that requiring tobacco companies to put the smoking cessation hot line number on their packs is merely a health warning, rather than a smoking cessation message." "Second, it is going to be difficult for the FDA to argue that the required warnings are the least restrictive interference with free speech that could accomplish the government's intended purpose in requiring that tobacco companies warn their consumers of the health hazards of smoking." Each of these points played a central role in Judge Leon's ruling. First, Leon found that the requirement for a smoking cessation hotline number on the cigarette pack made it abundantly clear that the purpose of the warning label requirement was not merely to provide factual information on health risks, but to advocate for smoking cessation. As he writes: "Thus, while the line between the constitutionally permissible dissemination of factual information and the impermissible expropriation of a company's advertising space for Government advocacy can be frustratingly blurry, here - where these emotion-provoking images are coupled with text extolling consumers to call the phone number "1-800-QUIT" - the line seems quite clear." Second, Leon found that the graphic warning labels are not even close to being narrowly tailored to advance the government's purpose: "it is quite clear that the Rule's graphic-image requirements in no way suggest the slightest attempt to narrowly tailor the display or presentation of the graphic images Congress mandated." Also, as I noted in more recent commentaries, the amicus brief submitted by the Campaign for Tobacco-Free Kids and other anti-smoking groups actually undermined the government's case. While the FDA tried to achieve a lesser degree of scrutiny by arguing that the purpose of the graphic images was to more effectively communicate health information, the amicus brief makes it eminently clear that the real purpose of the labels is to create a tobacco industry-funded anti-smoking campaign on the cigarette packs. Indeed, the fact that Judge Leon had difficulty discerning and articulating the government's primary interest in his opinion is a testament to the sneaky tactics of the FDA in trying to design a smoking cessation campaign under the guise of an information campaign. Had the FDA simply been honest and stated that its purpose was to save lives by deterring smoking, it would have at least been able to meet one of the prongs of the Central Hudson test. Sure, it would have had to give up on lesser scrutiny, but at least it could have tried to make a compelling case for why the government has a substantial interest in lowering smoking rates, something it failed to do in its arguments because it was unwilling to admit that the purpose of the warning labels was to deter smoking. Predictably, the Campaign for Tobacco-Free Kids responded to the ruling by issuing a press release calling the decision "wrong on the science" and "wrong on the law" but failing to point out either how the ruling is wrong on the science or how it is wrong on the law. In fact, the press release fails to address any of the relevant legal issues involved in the case. Professor Stanton Glantz responded to the ruling by issuing an email entitled "Bush appointed judge rules against FDA graphic warning labels." This implies that the decision was a purely political one and like the Campaign's response, fails to address any of the substantive issues of the case, or even to admit that it involves any substantive legal issues. Despite the anti-smoking groups' apparent confidence that this ruling will be overturned on appeal, I do not share that confidence. I do think there is a valid First Amendment issue of whether the government can compel speech by a company which is not purely factual but which is instead primarily intended to discourage sales of that company's own products. It would be one thing to require the Clorox company to place a warning on Clorox bleach that says: "Corrosive. Do not allow to touch your skin." It would be quite another, however, to require that 50% of a Clorox bottle contain a picture of a dead fish and urge consumers to call a hotline that promotes the use of natural products instead of household chemicals. A new study published this week in the journal PLoS Medicine confirms that Chantix (varenicline) is associated with a substantial increase in suicide, suicidal behavior, and depression, and to a much greater degree than nicotine replacement therapy even though Chantix was available during only four of the 13 study years. Of the total of 3,249 reported cases of suicidal/self-injurious behavior or depression during the study period, only 3% of cases occurred among NRT users, compared to 90% for varenicline. The authors adjusted the observed increased risk of these adverse outcomes among varenicline users for a number of potential confounders. However, they found that "varenicline has markedly higher reported risk than any of the comparators, a risk that was not reduced regardless of the form of adjustment used." The study concludes: "Varenicline shows a substantial, statistically significant increased risk of reported depression and suicidal/self-injurious behavior. Bupropion for smoking cessation had smaller increased risks. The findings for varenicline, combined with other problems with its safety profile, render it unsuitable for first-line use in smoking cessation." 2. "the FDA should consider revising the suicidal behavior and depression language in the Boxed Warning and Highlights of Prescribing Information to state clearly that the risks of suicidal behavior and depression are higher with varenicline than with other smoking cessation treatments." These results conflict with those of an earlier FDA study which found no increased risk of hospitalization for depression or suicidal ideation among users of Chantix. According to an article at WebMD.com: "The FDA is standing by its Oct. 24 review of two FDA-sponsored studies that examined hospitalizations for psychiatric reasons in users of Chantix and nicotine-replacement therapy." According to the article, Pfizer also denounced the new study's conclusions: "In a written statement, Pfizer spokesman MacKay Jimeson was highly critical of the reliance of Moore and colleagues on reports that came out after the drug went to market. 'Post-marketing reports can come from any source ranging from patients to health care providers, and from phone calls to Internet postings and lawyers,' he tells WebMD. 'Because of the many limitations of post-marketing reports, the conclusions made by the authors are not supported by the data.'" There is a good reason why the results of this new study conflict with those of the FDA-sponsored studies. In those studies, the outcome variable was hospitalization for suicidal ideation or depression. But hospitalization for these symptoms are quite uncommon (it takes a lot these days to get yourself admitted acutely for depressive symptoms). Moreover, the study would miss any suicides because persons are not admitted to the hospital for suicide. Furthermore, most of the serious adverse effects of Chantix are sudden and acute and would not necessarily be expected to lead to hospitalization. For this reason, I find the FDA's defense of its study and its apparent dismissal of these new results to be quite worrisome. It is also discouraging to see Pfizer criticizing this study on the grounds that it relies on post-marketing reports. It is precisely those reports which resulted in revelations about the adverse effects of drugs like Vioxx and which led to their removal from the market. Does Pfizer really want to be on record as arguing that post-marketing surveillance is not a valid source of information about possible unforeseen drug adverse effects? But the real rest of the story here is what it says about the participation of conflicted researchers (namely, those with financial relationships with Pfizer) on the FDA expert panel which recommended that drugs be used for every smoking patient and which listed Chantix as a legitimate first-line therapy. Clearly, that expert panel's recommendation is now in direct conflict with that of the Institute for Safe Medical Practices along with expert researchers from Harvard Medical School, Wake Forest University School of Medicine, and the Johns Hopkins University School of Medicine. The shame, however, is that as I reported in May 2008, the panel chair and eight members had financial conflicts of interest with Big Pharma. In particular, the panel chair received funding from Pfizer, the manufacturer of Chantix, at about the same time as his panel crafted the recommendation that this drug should be considered as first-line therapy for smoking cessation. Note that as of the writing of the report, the FDA had already issued a black box warning noting that agitation, depression, suicidal ideation, and suicide had been associated with the use of varenicline. The panel apparently downplayed this risk in its recommendations. Differences in clinical judgment are acceptable when they are genuine, but to have a disagreement like this which has the appearance of potentially being associated with a financial conflict of interest is, in my view, unacceptable. Moreover, from what I can tell, the 2008 guideline has not been updated to note the subsequent reports of Chantix's adverse effects, including to quantify the number of suicides reported with the use of this drug. No mention is made of the results from the new study above. Thus, physicians relying on the 2008 update do not have the information they need regarding the potential risks of varenicline. At very least, I think they deserve to know that the Institute for Safe Medical Practices along with expert researchers from Harvard Medical School, Wake Forest University School of Medicine, and the Johns Hopkins University School of Medicine do not believe that Chantix should be considered as first-line therapy for smoking cessation. Bias Against Cold Turkey Quitting is Apparent in Literature; Possibly Influenced by Financial Conflicts of Interest? During your last quit attempt, what was the primary method you used to try to quit? In comparing the effectiveness of each approach, you might compare the reported use of each strategy between successful and unsuccessful quitters. Suppose, instead, that you had a vested interest, or a bias towards not finding that cold turkey approaches are superior to NRT. What might you do? A clever approach would be to simply not list "cold turkey" as a potential answer. Instead, you might provide a very long list of potential smoking cessation aids, including books, web sites, group sessions, phone lines, group sessions, etc. Let the respondent check off all the strategies that they used. Then, at the end of the long list, include a category entitled "Nothing." This category would only apply to people who not only tried to quit unaided by medication, but who also failed to even look at a smoking cessation web site, make a phone call, watch a video, attend a group session, etc. This doesn't sound like a very motivated group of smokers, does it? What happens if you then use this category to classify smokers as "unaided" quitters (a very loose and inaccurate proxy for cold turkey quitters)? My guess is that you are going to get an artificially low estimate of the cessation rate for cold turkey quitters. Rather than a direct comparison of cold turkey quitting vs. the use of NRT, this provides a comparison of NRT against a loosely defined group of people who don't appear to have been very motivated to quit in the first place. Unfortunately, this appears to be the method used to ascertain the quit strategies used by smokers in the Smoking Toolkit Study, a series of monthly annual surveys in the UK which are designed to examine smoking cessation and the effectiveness of various cessation strategies. Despite this bias against cold turkey quitting, the results of a recent report from the study found that NRT was no more effective than "unaided quitting." This almost assuredly indicates that had cold turkey been pitted against NRT, it would have won hands down. Why this tremendous bias in what is supposed to be objective scientific research? Perhaps the apparent bias is less astonishing when one finds out the rest of the story: The study was funded by the pharmaceutical industry. by Cancer Research UK, Pfizer and GSK [GlaxoSmithKline]." Moreover, two of the researchers working on the Smoking Toolkit Study also have financial conflicts of interest with Big Pharma. As disclosed in a recent paper: "RW undertakes research and consultancy for the following developers and manufacturers of smoking cessation treatments; Pfizer, J&J, McNeil, GSK, Nabi, Novartis and Sanofi-Aventis. RW also has a share in the patent of a novel nicotine delivery device. AMC has received travel funding, honorariums and consultancy payments from manufacturers of smoking cessation products (Pfizer, J&J, McNeil, GSK, Nabi, Novartis and Sanofi-Aventis). He also receives payment for providing training to smoking cessation specialists; receives royalties from books on smoking cessation and has a share in a patent of a nicotine delivery device." That paper also acknowledges that the Smoking Toolkit Study is funded by: "Pfizer, GlaxoSmithKline and Johnson and Johnson." Perhaps worst of all, in the recent paper that reports the results of the Smoking Toolkit Study, the author (RW above) fails to disclose any financial conflicts of interest and the report fails to disclose that the study is funded by several pharmaceutical companies. The rest of the story is that there does indeed appear to be a bias in favor of pharmaceutical smoking cessation aids, and there is at least the appearance that this bias is at least in part related to the receipt of money from pharmaceutical companies. When is a Financial Conflict of Interest No Longer a Conflict? In the past two sets of commentaries, I have revealed examples of tobacco control researchers who failed to disclose past conflicts of interest with the pharmaceutical industry. Although failing to report these "prior" conflicts was in compliance with the journal or professional organization policy, I opined that although they occurred in the past, these conflicts were still significant and relevant and therefore should have been disclosed to readers nonetheless. Today, I address the tricky issue of: When is a conflict no longer a conflict? Example 1: Professor X is a chemist at the University of Louisville. He studies the levels of particulate matter and other chemicals in ambient air for use in exposure assessment. In 2011, he publishes a paper entitled "Levels of Secondhand Smoke in Owensboro Bars: No Evidence that Regulation is Necessary." For the past 3 years, he has been employed at the University of Louisville and hasn't had any funding or consulting income from any corporations. The journal requires disclosure of any financial conflicts of interest within the past 3 years. Is it acceptable for Professor X to file a "no" disclosure (i.e., not to disclose any financial conflicts of interest)? According to the reasoning being used by Dr. Fiore, Dr. Carpenter, and many others in tobacco control (and according to numerous comments I received from tobacco control colleagues in response to my commentaries), the answer is a resounding "No." Since the journal only requires the disclosure of conflicts within the past 3 years, Professor X need not disclose any financial conflicts of interest. There is nothing wrong with him claiming that he has no financial conflicts of interest, and there is no reason for journal readers to have any more information about past potential conflicts. Example 2: Professor Y is an epidemiologist at the Health Policy Institute. He studies the effects of various exposures on disease risk, as he has done for decades. In 2011, he publishes a paper entitled "No Evidence of Increased Heart Disease Risk among Secondhand Smoke-Exposed Workers. For the past 3 years, he has been employed at the Health Policy Institute and neither he nor the Institute had any funding or consulting income from any corporations during that time period. The journal requires disclosure of any financial conflicts of interest within the past 3 years. Is it acceptable for Professor Y to file a "no" disclosure (i.e., not to disclose any financial conflicts of interest)? According to the reasoning being used by Dr. Fiore, Dr. Carpenter, and many others in tobacco control (and according to numerous comments I received from tobacco control colleagues in response to my commentaries), the answer is a resounding "No." Since the journal only requires the disclosure of conflicts within the past 3 years, Professor Y need not disclose any financial conflicts of interest. There is nothing wrong with him claiming that he has no financial conflicts of interest, and there is no reason for journal readers to have any more information about past potential conflicts. Here is the rest of the story about Professor X. As it turns out, Professor X spent most of his career as a research chemist in the Laboratory Division of Brown & Williamson. He worked there for 34 years, during which time he produced articles that helped the company deny that nicotine is addictive, that secondhand smoke is hazardous, and that active smoking is as harmful as public health authorities claim. Four years ago, he "retired" from Brown & Williamson and took a position at the University of Louisville. How many people in tobacco control still think that Professor X has no obligation to disclose his prior conflicts of interest? I would venture to say none. Moreover, I would venture to say that if this occurred in real life, a contingent of anti-smoking groups would publicly attack Professor X for failing to disclose his prior employment at Brown & Williamson and that they would attempt to discredit the study on that basis. Now here is the rest of the story about Professor Y. As it turns out, in 1985 Professor Y became Vice President of the Thomas Institute Policy Analysis Center (TIPAC), a consulting firm funded initially by a $400,000 grant from the Brown & Williamson Tobacco Corporation. Following its initial formation, TIPAC continued to receive hundreds of thousands of dollars in funding annually from a number of tobacco companies. Professor Y worked on Research & Development projects for B&W Tobacco, such as analysis of the sensory perception of smoke and how to reduce the amount of tobacco in cigarettes. By 1995, Professor Y was a full-time consultant on environmental tobacco smoke issues for the Tobacco Institute. In 2005, he took a position with the Health Policy Institute. Both his initial salary and the Institute's start-up costs were paid for by Philip Morris. For the last four years, however, the Institute has found private donors and has not had to rely on any tobacco industry funding. How many people in tobacco control still think that Professor Y has no obligation to disclose his prior conflicts of interest? I would venture to say none. Moreover, I would venture to say that if this occurred in real life, a contingent of anti-smoking groups would publicly attack Professor Y for failing to disclose his prior history of involvement with the tobacco industry and that they would attempt to discredit the study on that basis. It is clear from these examples, I hope, that past conflicts of interest are indeed critical for readers to know about. Just because Professor X and Professor Y had nothing to disclose during the past three years does not indicate that they have no financial conflicts of interest that need to be disclosed in their current publications, the journal's requirements notwithstanding. Furthermore, it would be hypocritical and inconsistent to argue that past conflicts are only relevant when it comes to tobacco. If past conflicts are relevant, then past conflicts are relevant. Therefore, it is my feeling that researchers do need to disclose their past conflicts (albeit briefly). A financial conflict of interest does not disappear simply because the conflict is no longer active. In 2007, a tobacco researcher who is near and dear to you (actually, despised by many may be closer to the truth) - Dr. Michael Siegel - accepted $400,000 from a start-up electronic cigarette company to advise the company on how to best market its products, deal with potential FDA and other regulatory matters, and conduct valid scientific studies to test the safety and effectiveness of the product. The consulting work concluded by the end of 2007, Dr. Siegel was paid in full in that year, and has not had occasion to do any further paid consulting for electronic cigarette companies. I would be willing to bet (up to $400,000 in fact) that if I did not disclose my prior financial relationship with an e-cigarette company, anti-smoking advocates would grill me over the coals for failing to disclose that fact, even though it occurred four years ago and I am not required to report it by the journal. I am sure I would be attacked even though I would be in full compliance with journal and institutional policies. Clearly, past conflicts of interest are relevant and I believe that researchers have the obligation to disclose past conflicts that are related to the research in question. Is there any circumstance in which a past conflict of interest does indeed "disappear" or become inactive to the point that it need not be disclosed? I can think of just one. If a researcher were to renounce his past involvement with a particular industry, vow to never accept money from that industry in the future (whether in the form of grants, employment, honoraria, consulting, lecture fees, etc. ), to make this vow public (by publishing it on a personal or institutional web site), and to demonstrate the commitment by going a certain period of time (e.g., 5 years) in compliance, then one could potentially argue that the investigator has truly put the financial relationship in the past. As there is no opportunity for any funds to be received from that industry ever again, this could in fact put an end to the potential influence of the previous conflict. Short of that, there is simply no way to argue that a past conflict is no longer present. For example, in the example above, I accepted e-cigarette money in 2007. I then write a paper in 2011 about the effectiveness of e-cigarettes and I don't disclose any conflicts since none are "current." Then, the day after the paper is published, I get a call from "Heavy Metal Cigs," which wants to pay me $1 million for helping them plan a definitive clinical trial on the effectiveness of electronic cigarettes (note: my phone lines are open). So was I really unconflicted in 2011 when I published my paper, or was I just waiting for the right offer to come along? And how could we ever know the willingness of any particular researcher to take corporate money in the future, short of a public vow? The rest of the story is that prior conflicts of interest - even if "active" before a journal's "disclosure period" - need to be disclosed if they are directly related to the topic of the research, as they are still potentially relevant to the reader. If the conflicts are small in magnitude and unlikely to affect the appearance of impartiality, then that is a judgment that the reader is free to make. But without the information, then we clearly lack the information we need to be able to make an informed judgment. Unfortunately, the last example was only an example. Had I actually received $400,000 in 2007, I would certainly not still be driving my 120,000+-mile 1998 Saturn SL.